John Curley, hard hitting private investigator and author of the forthcoming novel, BONDS. "BONDS" by John Curley brings a stark and striking new voice to crime fiction. In a world overflowing with novels about PI's who are supermen, Jonathan Creed stands out as a regular human being, flaws and all. Mr. Curley has obviously walked the streets he writes about, and that experience translates neatly to the page. The character of Creed himself is a stand out. Instead of relying on luck (or lucky accidents), Creed hits the streets and does some actual detecting. As in real life, he already knows his work will have consequences for others, but this time he learns that sometimes his work has consequences for himself. "Don't fool yourself: this is not a TV or Fantasy Private Investigator who solves problems with his fists or a gun as the first resort. Jonathan Creed is the real deal and, as a reader, you'll not only come to like him as a person, but his cynical - yet romantic - view of the world will sometimes tug at your heartstrings." - Will Graham, author of SPIDER'S DANCE and others. 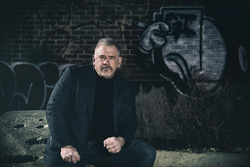 John Curley has spent 31 years working as a private investigator and security consultant. He is the president of J Curley and Associates. A martial arts practicioner since 1981 and a teacher since 1986 he is also an advocate for child protection and a life long Staten Islander. Author website is johnacurley.com on Facebook as johnacurley and Twitter as NuYawkpi.